Many people hesitate to use cannabis because they dislike the idea of smoking. But guess what? You don’t have to inhale anything to experience the effects of cannabis. You can consume cannabis through these methods and still reap the medicinal benefits without smoking. These three popular consumption methods let you experience cannabis smoke-free. Keep in mind that each method has its own onset time, duration, and effects. Who doesn’t like to eat? And if you’re one of the many people who enjoy food, you should be rejoicing. Because in addition to giving your taste buds a treat, marijuana edibles can get you high. Marijuana edibles come in all shapes and sizes. You can find lollipops, brownies, peanut butter cups, mints, and many other foods infused with cannabis. Edibles give you a more body-focused high, so they’re great if you’re trying to escape from pain. One thing you should know about edibles is that they are very potent, and take much longer time to take effect. It can take an hour or two for it to kick in, so stick to the recommended dose and don’t get too impatient and end up eat eating one too many brownies. So good food isn’t your thing? That’s cool. You can experience cannabis with a tincture. Tinctures are made from cannabis extract infused with alcohol. Before cannabis was prohibited as medication, tincture was the most common form of it. There’s no need to smoke cannabis and there’s no need to blow your daily calorie intake with a cookie infused with it. To take your tincture, all you need to do is drop your dose under your tongue. You also don’t need to be a chemist to get the measurement right. It’s easy to measure and just as easy to put in your food. Without changing the flavor, you can put your tincture in your juice, soup, or ice cream. CBD Tinctures are also available if you do not want to feel any psychoactive effects after consumption and are simply looking for the benefits. If you’re against putting anything cannabis-related in your mouth, that’s fine too. You can use a topical. Cannabis topicals include lotions, balms, and oils that have been infused with cannabis. When you rub a topical on your skin, it can relieve any pain in the area as well as reduce swelling and inflammation. Most topicals (except for transdermal patches) don’t give THC the chance to reach your blood. So, you won’t feel the psychoactive effects of being high with it. Instead, you only get localized pain relief. While some people might see that as a downside, others might prefer this kind of relief. 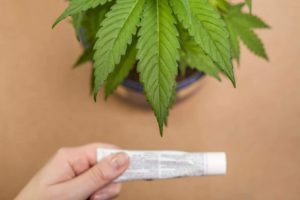 Topicals are most commonly used to treat pain or soreness but the great world of medical marijuana is shining some light on its other possible uses. Topicals may also work on relieving headaches, dermatitis, cramping, and itching. Try New Cannabis Consumption Methods Today! Now that you know you can get the amazing benefits of cannabis without the smoke, there’s no reason to hesitate. Indulge in an edible, try a tincture, or skip the high with a topical. No matter which method you try, each of them has their own effects that can be incredible and beneficial to your overall health. Gain access to medical marijuana through the doctors at MMS Canada and reap the benefits today!